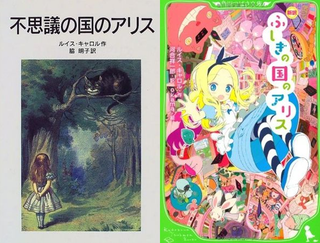 The vast majority of book cover art in Japan is fairly conservative. Tasteful, even. But one publisher is trying to "update" classic books by covering them in anime art. Tokyo-based Kadokawa is one of Japan's largest publishers. In recent years, the company has expanded into movies and video games. Seeming to take advantage of its manga-publishing arm, Kadokawa has a line of fairy tales and other children's classics that have been given "contemporary covers" to appeal to younger readers. By "contemporary," it looks like they mean giving the books manga-style covers. The result is trippy and somewhat ridiculous. These classics with "cute" art are not new, and really started to appear in larger numbers in the last two years or so. Here, have a look. The more traditional covers are on the left, while the more "modern" ones are on the right. So they're not exactly manga, as the text is laid out like a traditional Japanese book. However, they do have a lot of pictures in them. In all fairness, lots of books aimed a kids do, too! That being said, I cannot believe they even changed The Little Prince's iconic cover art! Fret not: other Japanese publishers, such as Shinchosha, also publish a translation of The Little Prince and use the traditional (and correct!) cover. You'll be happy to know that these other books are also available from other publishers if more traditional covers. Maybe you won't be happy to know that. I dunno! As previously mentioned, Kawade Shobo also has a line of picture books with anime art. While those are aimed at a younger age group than the books from Kadokawa and Shueisha are going for, the sentiment feels the same. And that is? Saccharine. Have Japanese Art Styles Gotten Better? Or Worse? Look, the publishers appear to know they are competing with comic books for readers. This is a ploy to get them to read these books, and as ridiculous as the art can seem, that isn't necessarily a bad thing.